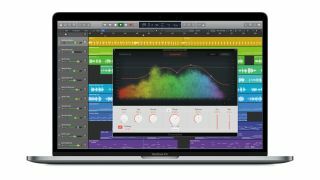 NAMM 2018: Apple has released its now traditional NAMM-time Logic update - version 10.4 should be in the App Store as you read this. It’s another freebie for Logic Pro X owners, and features a new tempo detection technology and additional plugin effects. Smart Tempo, as its known, is designed to manage the tempo of all the content in a project. So, musicians can free themselves from the tyranny of the metronome and record without a click track; everything will then automatically sync to the tempo of that performance. This new feature also has advantages for remixers and mash-up artists, who’ll now be able to combine recordings from multiple sources and see them automatically locked in time together. Of the new effect plugins, ChromaVerb is literally the most eye-catching: this new algorithmic reverb has a colourful, interactive interface and enables you to emulate a wide range of spaces. The interface has been kept pretty simple so that anyone can use it. Vintage EQ, meanwhile, comprises three plugins that are modelled on classic hardware EQs: Vintage Graphic EQ, Vintage Tube EQ and Vintage Console EQ. Music technology veterans shouldn’t have any trouble recognising the units that inspired them. Finally on the plugin front, it’s a warm welcome back (sort of) for Camel Audio’s CamelPhat and CamelSpace plugins, which have been revamped and reborn as Phat FX and Step FX. As you may recall, Camel Audio was acquired by Apple in 2015, and the company’s Alchemy synth had already been added to both Logic and GarageBand. For the uninitiated, Phat FX is a multi-effect that’s designed to add warmth, punch and presence, while Step FX can be used to add rhythmic movement and includes filters, effects and step sequencers. The 10.4 update is rounded-off by some additional sound content. There are two new brush-playing Drummers (and two new brush kits in Drum Kit Designer), 800 additional loops and 150 cinematic presets for Alchemy. Logic Pro X 10.4 is available now from the Mac App Store. The update is free for existing users, and the price for first-time buyers remains at £199.99/$199.99.